Meet Two Unlikely Heroes With A Bone To Pick. 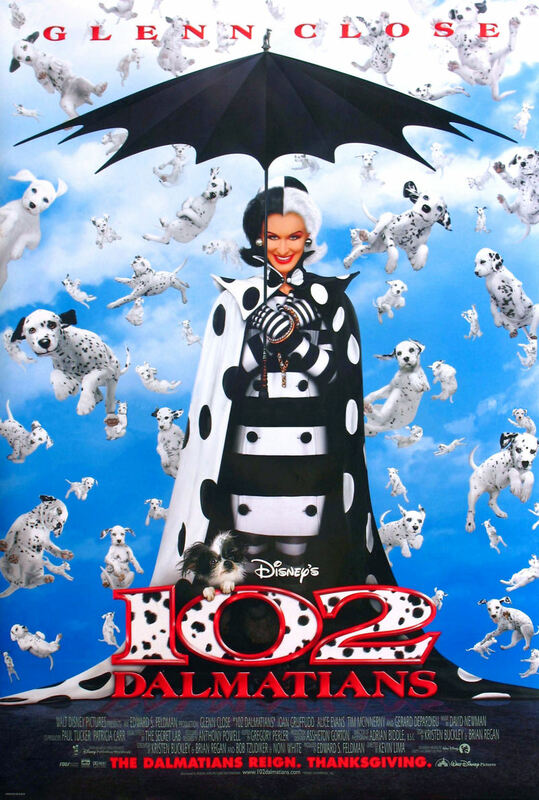 The sequel "102 Dalmatians" takes place three years after the events of its live-action predecessor. The main character to return from the first movie is the nefarious villainess Cruella De Vil, who has developed an aversion to fur after extensive therapy. She is deemed to no longer be a threat, and she is told that her estate will be divided and distributed to animal shelters if she ever gets into trouble again. Cruella starts her life over with good intentions, but her parole officer, the owner of Dipstick, a puppy featured in the first film, mistrusts her. She keeps a close eye on her, which turns out to be a good thing because the effects of Cruella's treatment wear off when she hears clock chimes.